In case you missed the announcement at the APAC conference last month, Learning List and the College Board have partnered to provide detailed, independent reviews of Advanced Placement (AP) materials. For each material, Learning List provides three independent reviews, including a detailed review of the material’s alignment to the Learning Objectives and Skills/Practices in the course framework. The College Board will use Learning List’s reviews to select materials for the Example Textbook Lists for AP math, science and social studies courses. A material’s inclusion on an Example Textbook List means that the material has some degree of alignment to the course framework; it does not mean that the material is aligned to 100% of the course framework. This table shows the alignment of materials included on the AP Calculus, Computer Science Principles and World History Example Textbook Lists. Learning List’s detailed alignment reports help educators quickly identify (1) the specific Learning Objectives and Skills/Practices to which the material is and is not aligned, and (2) for standards to which the material is aligned, specific pages/lessons that present all the knowledge and skills the standard requires. This blog post is the first of a series that Learning List will publish to help educators understand the underlying philosophy and components of the course frameworks, as well as trends observed from reviewing AP materials. In 2009, the College Board began a 15 year process of replacing the amorphous “course descriptions” for AP courses with far more detailed course frameworks. 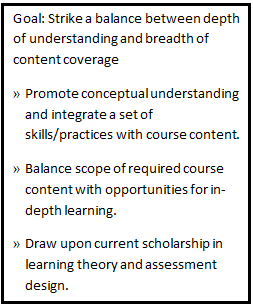 The goal of the course frameworks is to strike a balance between depth of understanding and breadth of content coverage. The frameworks reflect feedback from a diverse group of tenured college faculty and department chairs, AP teachers, Discipline Leaders, Academic Organizations, Cognitive Scientists and the public. The Understanding by Design instructional model and Evidence-Centered Design research serve as the foundation for the new frameworks which specify what students must now and be able to demonstrate on the AP exam. The courses integrate a set of skills and practices within the content, include a clear articulation of required learning objectives, and provide flexibility to include the kind of in-depth learning experiences that will prepare students for success in college coursework. Over the last several years, course frameworks have been developed for AP Biology, Chemistry, Physics I & II, US History, European History, Art History, Human Geography, Seminar and Research courses. New frameworks for Calculus AB and BC, World History courses and a new Computer Science Principles course will be implemented for the first time this school year. A subsequent blog post will explain the core components of the redesigned frameworks.